Perhaps you have heard of the latest collecting craze in the Upper Peninsula of Michigan? 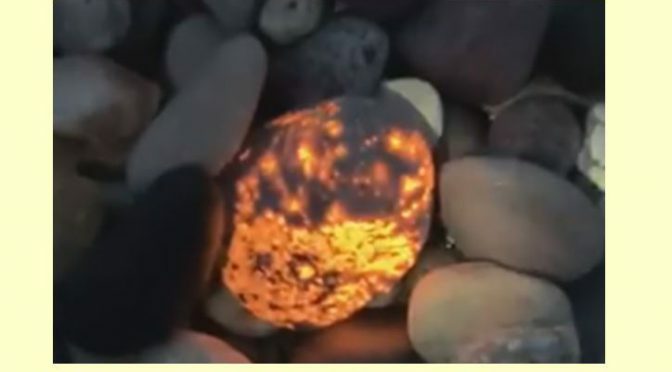 Beach collectors who have generally restricted their collecting to agates, amygdaloidal basalt, and perhaps an occasional greenstone are now returning to the beach after dark with a long wave UV light source. They are finding beach rocks that are bright yellow when subjected to a 365 nanometer long wave light source. Apparently there are some beaches where these stones are relatively common. Wayne County Gem and Mineral Club’s September Adirondack field trip was another great success. Seven spots in 4 days with the Saturday AM visit to Benson Mines in Star Lake attracting the most collectors. 33 folks convened and enjoyed a morning collecting in the dumps of the open-pit iron mine just outside town. Five of the other sites visited were repeats for the club (Rose Road, Benson Mines, Talcville, Valentine Mine, Fine roadcut, and Moose River). However, we had never been to the Seavey Road marble quarry north of Gouverneur. 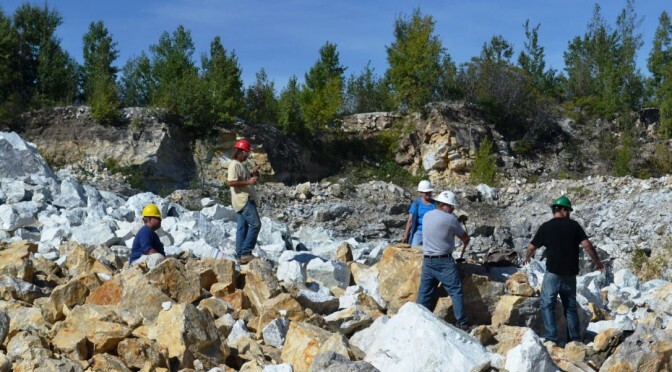 Thanks to Ken St. John, who had visited earlier with a small group of fluorescent mineral collectors, and to quarry owner Kevin Dibble, we were able to spend three hours in the large, and very white, quarry. As a new site for us, the Seavey Road location deserves a review. My son, Isaac, and I joined the club on the field trip to the Jerusalem Road Gorge in Ilion earlier this year (see July 2015 WCGMC News). In sorting through the material we brought back (yes, we left the deer skeleton) I exposed the rocks and minerals to UV light. I thought that I’d share the pictures. Another very interesting guest article for the April 2015 WCGMC newsletter. Ken St. John has graciously permitted me to place his note onto my website. Clearly, the information contained here complements that I had previously posted about this most interesting location. To be honest, I can’t remember when I made my first trip to the Rose Rd. site in Pitcairn. It was a few years ago and Bill Chapman was involved in the introduction to the site. My first visit was a daytime affair with the Wayne County club in search of titanite. I do recall that titanite was something new to me at the time and that I was excited to be there with the club and my kids. The site is a wooded outcrop beside a phone tower road. No problem at all in getting to the place. There are essentially two parts to the site up and downhill and during the first visit we pretty much worked the downhill location. My nicest pieces contained wollastonite, titanite, apatite, albite and diopside. The titanite is a dark brownish color while the diopside is a rather coarse light purple massive mineral. Mixed with green apatite and white wollastonite specimens were both interesting and attractive. It was much later when doing a routine sweep of my collection with a short wave UV light that I discovered that the Rose Rd. rocks were more interesting under the UV light than they were in daylight. It’s not unusual to see a three color response with wollastonite fluorescing a light tan, albite a cherry red, and an invisible coating glowing a bright green. As a member of the Fluorescent Mineral Society and a Franklin collector, I was impressed. So were the other FMS members to whom I showed the pieces at the annual meeting. From then on, I collect at Rose Rd. with an eye toward the fluorescent.